TOA - BUY THE BEST ! One used unit removed from use and the other is NEW. Actual item from lot is shown. Only what is shown is included. Guaranteed functional. NOTE - we are selling these in pair lots ONLY. Ceiling-mount speaker unit used with associated equalizing controller (wall-mount installation also possible). 12cm full-range unit with bass-reflex enclosure. The speaker panel diffuser provides a wide coverage area even for the high-frequency sound spectrum, ensuring excellent total audio response. The F-121C low-impedance (812) speaker system is rated at 120W continuous program input. Built-in F-121C overload protection circuitry automatically activates to prevent damage from excessive input levels. Flame-resistant grade ABS resin employed for the enclosure and frame. "Spiral stopper" construction enables attractive and easy flush-with-ceiling installation. Simple, pleasing design and punching net diffuser cover.  The TOA F-121C is significantly better than Conventional Speakers in its ability to disperse the High Frequencies throughout the Classroom and provide an extremely Wide Quality Sound Coverage. The F121C Speaker is your best choice for large classrooms with its Dedicated Equalization Module, which delivers Superb Sound Quality that has become the standard for University Classrooms. Wide Dispersion Speakers versus Normal Speakers, in a 65' x 65' Room. 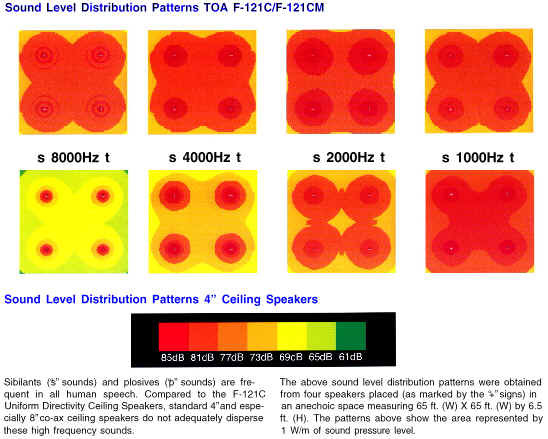 The picture above shows how well the TOA F-121C Speaker uniformly disperses the High Frequency Sound as compared to Standard Ceiling Speakers. however, only One F-121C Speaker is required in a 32' x 32' Classroom. The wide dispersion characteristics of the TOA F-121C Speaker provide a Uniform Sound Level, throughout the Classroom, for all the Students.